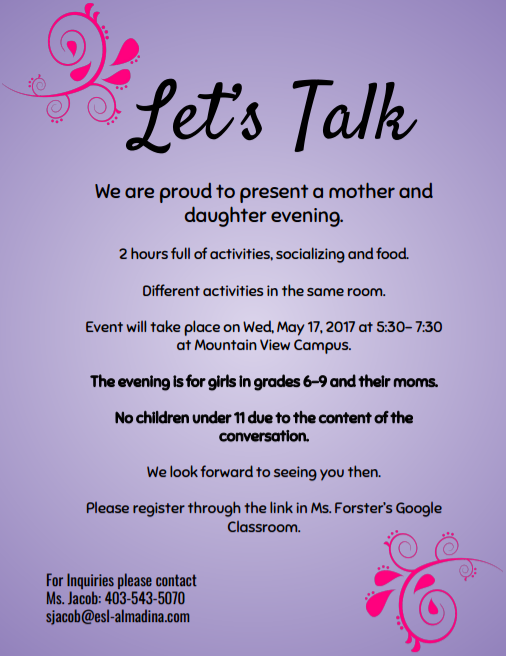 We are proud to present a mother and daughter evening. 2 hours full of activities, socializing and food. Different activities in the same room. Event will take place on Wed, May 17, 2017 at 5:30- 7:30 at Mountain View Campus. The evening is for girls in grades 6-9 and their moms. No children under 11 due to the content of the conversation. Please register through the link in Ms. Forster’s Google Classroom.